Thanks to some recent price drops to various places in Asia, it's possible to find airfares from Vancouver that allow you to visit multiple countries, and keep the price very reasonable. 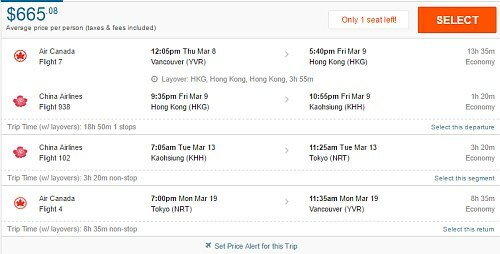 There's a 2-in-1 trip that allows you to fly from Vancouver to Kaohsiung, Taiwan (spend time there) and then fly to Tokyo, Japan (spend time there) and fly home to Vancouver - for a total of $665 CAD roundtrip. 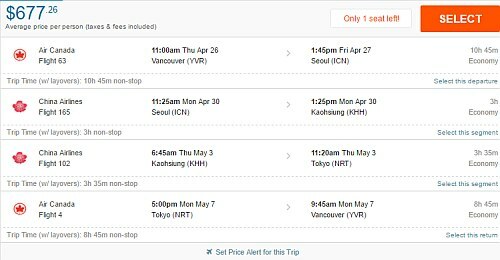 And there's a 3-in-1 trip that allows you to fly from Vancouver to Seoul, South Korea (spend time there) and then fly to Kaohsiung, Taiwan (spend time there) and then fly to Tokyo, Japan (spend time there) and fly home to Vancouver - for a total of $677 to $707 CAD roundtrip. What's even more amazing is that some of the 3-in-1 trips have non-stop flights the entire journey. NOTE: You can try your own dates to see what comes up. There are many more possible date combinations. I would focus on Monday, Tuesday, Wednesday, Thursday, and Friday dates in the months listed above. There should now be input boxes for you to input up to 4 flights. 4 Responses to "2-in-1 and 3-in-1 trips (Vancouver to Taiwan, Japan, South Korea) - $655 to $677 CAD roundtrip including taxes"
Unfortunately these did go up in price today.